There is no better way to experience Greenland’s dramatic scenery with the ultimate nature experience: climbing and technical walks on the rock walls at Ilulissat and the Oqaatsut village. You learn how to go for the climbing, technique, and use of equipment – and you can safely explore a world-class climbing area and test your own boundaries. We offer all kinds of climbing activities and technical hikes (walks involving the use of climbing tools). Rock climbing is possible all year round and in the winter-spring season we also offer ice climbing. The security is top notch and you will always be in love with our professional climbing instructor at any time of the trip. Climbing and technical hiking do not require any special features, but it is good that you are in good shape to be able to walk in the mountains. All equipment is included in the price, also coffee / tea. Zero-impact climbing: We leave the mountains just as they have been for millions of years, which means not leaving any metal in the mountains and taking all our garbage with us. In Ilulissat: We have three hiking trips on offer in Ilulissat. 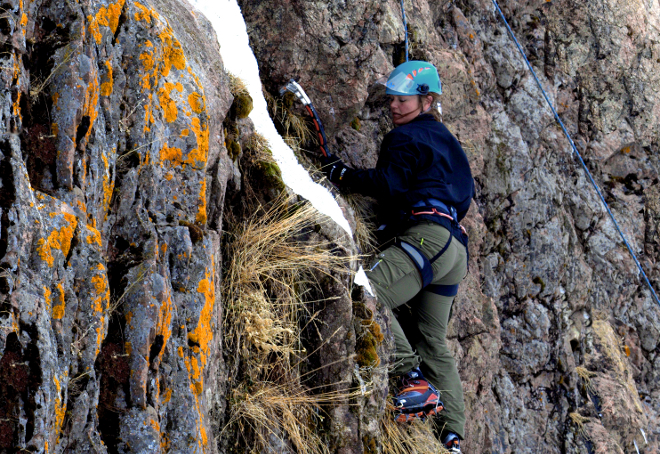 They allow you to enjoy the Greenlandic nature while you, depending on the level of difficulty, learn about climbing. All tours are tailored to the wishes and physics of the participants, which means that our activities are also suitable for beginners and those suffering from altitude cracking. You can choose how much distance the activities should run over and what level of difficulty fits your level of experience.